Picked up a box Saturday. 6 packs per mini-box with 5 cards per pack except for pack with medallions. Guaranteed an auto, medallion or sketch per mini-box. On box yielded...35/100 base, 4 base refractors, 4 Droids, 4 Solo, 2 Rogue One1, 2 extended base, 1 ex base refractor gold, 2 blue, 1 green, 1 gold, 1 parallel medallion and 1 parallel auto. Pros: Really nice Lightsaber medallions, and Rogue One & Solo inserts. Cons: Definitely not 1996 Finest. Some backgrounds interfere with the image. Kind of look like defects. While refractors are on thicker stock it would have been better to print "REFRACTOR" or "R"# on the back. Price!!! Box done. Anybody else open a box? All I hear are crickets...way too quiet!!! I hadn't planned on purchasing a box of this, but one was there in my local shop one day. I couldn't resist. I found that the easiest way to identify the base refractors was to look at the side of the cards. The white side on the thicker card made it easier to pick them out. 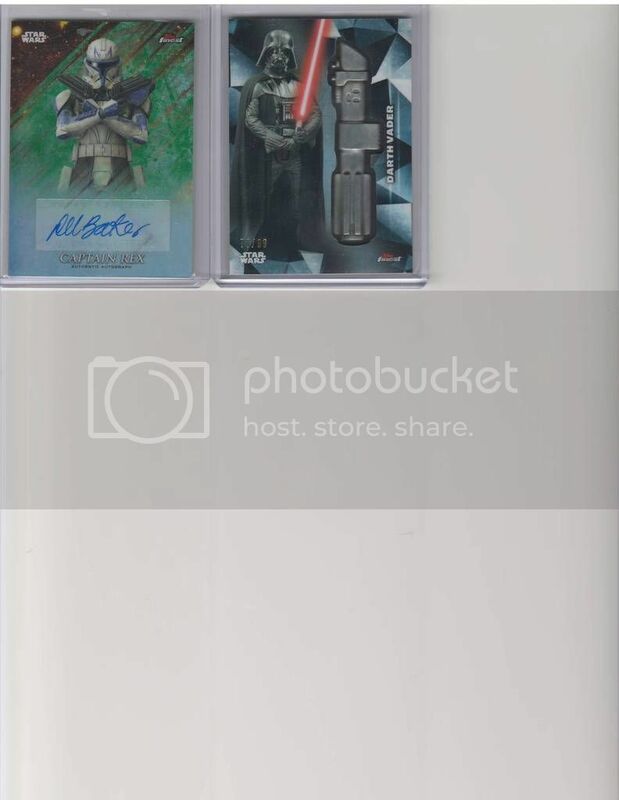 This is the second time that I have pulled a redemption card for a Topps Star Wars autograph card. The first time was last April for a 2017 release, and I still don't have it. I hope this one is delivered sooner rather than later.